The foundations of Integrated Pest Management (IPM) are rooted in economics. Simply put, IPM theory provides a basis for decision-support, with the goal of balancing or exceeding crop yield, quality, and plant health targets with pest management inputs (costs). Putting a well-established IPM program in use can help you address the following questions: Is treatment warranted (i.e., cost-effective) based on the pest population present? What are my best options and timings for treating economically-damaging populations? Particularly in years where crop prices are relatively low, taking this approach has the potential to save cost inputs by reducing the overall number of sprays needed to protect the crop, and by making wise decisions when it comes to the types of management tactics or materials used to minimize damage. In walnuts, we are fortunate that one of the key pests, codling moth, has a very well-established and validated IPM program. The keys to this program are the predictable phenology and degree day development models and treatment thresholds (based on orchard history and in-season trap and damage counts during each flight). In addition, codling moth can be effectively managed using a number of methods (individually or in combination), including conventional pesticides and mating disruption. Bear in mind also that a good codling moth management program that minimizes early- and mid-season damage has been shown to effectively reduce harvest damage by navel orangeworm. Codling moth on apple. Photo credit: UC IPM Program. Begin the season by hanging codling moth traps, typically by mid-March. Although we have had an unusually wet and cold winter to date, we are entering a warmer and drier stretch beginning this second full week of March. The trees and insects will begin responding to this more typical spring-like weather soon! Place delta or wing traps containing codlemone (codling moth pheromone, 1X or L2) lures in the tree canopy. In or near mating disruption orchards, consider also using traps baited with combination lures containing codlemone + pear ester plant volatile (CMDA), as pheromone-only trap captures may be shut down or significantly reduced if mating disruption pheromone plumes are active in the orchard. Check traps twice weekly to determine first flight biofix in your orchard(s), which is the first date that moths are consistently caught in traps and sunset temperatures are above 62°F. Trap checks can be reduced to once weekly once biofix is established, but you may want to check more often throughout the season during peak flights, key treatment timing periods, and when anticipating subsequent biofixes. Once you know your first flight biofix date, you can begin tracking degree day accumulations to inform treatment timings and predict the onset of subsequent flights. Degree day models are essentially mathematical models that pair the known developmental requirements (heat units) for a specific pest developing in a specific crop with actual heat units accumulated each day (maximum and minimum temperatures). The degree day calculator for codling moth in walnuts can be found here. Choose the CIMIS station nearest your orchard, or upload site-specific data from your orchard if you have an in-field temperature station. Typical degree day accumulations for first flight peaks and subsequent flights are shown in Table 1. Note that there is a range of degree days for each flight prediction – always confirm population cycles with in-field trap activity. For example, the second flight biofix averages 1060 DDs after the first biofix, but can vary, so you would set second biofix in your orchard as the date trap counts begin to consistently increase again after the first flight within a range of 800 to 1300 accumulated DDs. Additionally, in many years and most valley locations, a third flight will be apparent, but we don’t always observe a significant fourth flight in the Sacramento Valley. Codling moth typically enter diapause by late August, however, if 650 or more DDs have accumulated between the third flight peak and the third week of August, the fourth flight may emerge in late August and September. Table 1. Degree day model predictions for codling moth in walnut. Determining the need to treat is based on orchard history, in-season trap catches, and in-season damage evaluations (dropped nuts and canopy counts), depending on the flight. Table 2 summarizes the current UC IPM Program Pest Management Guidelines suggested treatment thresholds. Once you have determined the need to treat your codling moth population, the mode of action and residual performance of the selected insecticide will inform the most effective application timing. Optimal treatment timings are included on the product labels for each material, and are detailed in the UC IPM guidelines. The primary insecticide modes of action most commonly used for codling moth in recent years are pyrethroids, organophosphates (use becoming less common), insect growth regulators (e.g., Intrepid®), and diamides (e.g., Altacor®). Typically, IGRs and diamide materials are applied slightly ahead of typical pyrethroid and OP treatment timings (50 to 100 DDs earlier). Table 2 Population assessment (monitoring) practices during each flight and suggested treatment thresholds for codling moth in walnut. Mating disruption is a proven population and damage reduction alternative (or addition) to conventional insecticide approaches for codling moth. Certainly in “lean price” years, adopting a new strategy that may be more costly to implement may not be on your radar. However, consider mating disruption a longer-term investment relative to your annual pesticide program and the benefits it may provide your operation over the course of several years. In many cases, codling moth mating disruption programs can effectively reduce or completely eliminate the need for supplemental insecticide sprays. In addition, with increased regulation targeting the use of some of our historically-relied upon (and cheap!) insecticides, multi-spray programs dependent on more costly, newer generation materials may end up costing you the same amount over the course of the season (taking into account materials, as well as labor and application costs). If you have been successfully implementing mating disruption in recent years, my advice would be to “stay the course.” The value of mating disruption (and your investment) is likely increasing year after year. 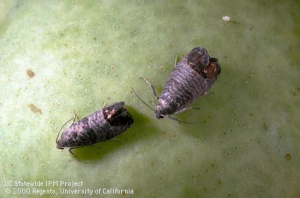 Take advantage of the well-established IPM guidelines for codling moth, and look to maximize your returns by reducing inputs while maintaining yield and quality.